It's not the easiest place to get to... or the easiest conditions to work in... but if you want to get National Geographic quality pictures of an American Bald Eagle... you need to head to Haines, Alaska in November. That's where I just came back from. There are a few places you go in the world to get certain shots. If you want grizzly bears, for example, you head to Brooks Falls in the Katmai Wilderness. Polar bears... Churchill, Manitoba. Puffins... Machais Seal Island off the coast of Maine... Wolves... Yellowstone National Park... and so on. 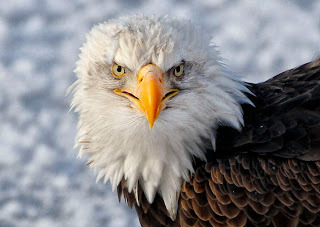 And if you want Eagles, you go to Haines. You see, in Haines, Alaska there is a river called the Chilkat. It's not all that special when you look at it. Looks pretty much like most Alaskan rivers. But here's the deal. The Chilkat has a Geothermal spring under one section of it... the section just outside Haines. And here's why that is important. Salmon run up the Chilkat every fall by the thousands where they spawn. Anyone who has ever studied Salmon knows what an amazing story that is in itself. Then, they begin to die. It doesn't happen all at once but it always happens. The salmon grow distorted, stop eating and basically give up, dying in the river they were born in. This happens just as winter arrives in Southern Alaska. And winter shows up quick. When it does, it freezes the Chilkat. The salmon that aren't caught in the ice begin floating downstream with the current... under the ice. Some of them are dead... the rest of them soon will be. They float under the ice for quite a long way... until they reach the Chilkat Bald Eagle Reserve just outside of Haines. Here's where it gets interesting (nature is pretty fascinating actually). Because of the thermals under the Chilkat near Haines... the river does not freeze. Or at least parts of it don't. 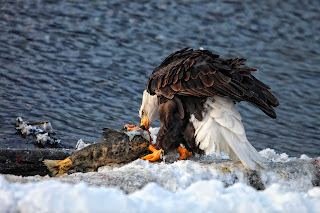 So eventually the remaining salmon, either dead or dying, pop out from under the ice.... and the eagles are waiting. By the hundreds. Some years as many as 3500 eagles have been counted in the trees around Haines. They come for one month, November... and so do the photographers. 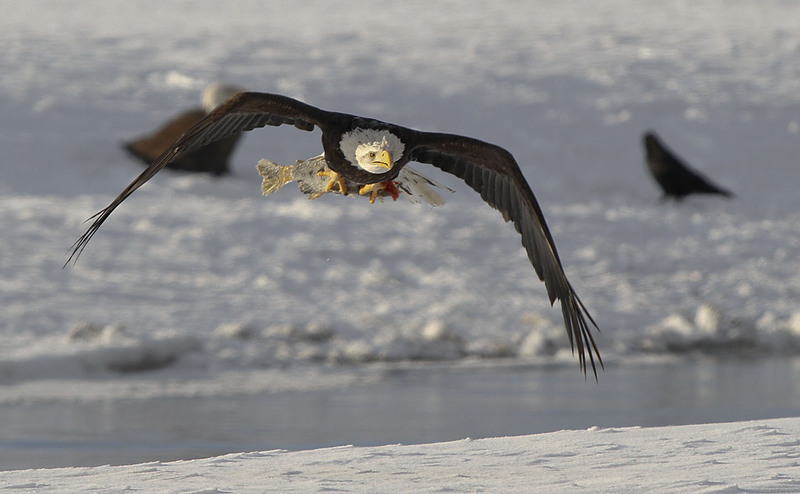 There is no better place in the world to photograph eagles. 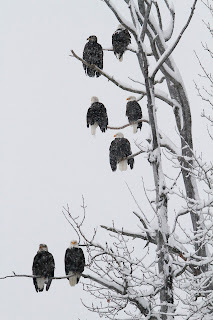 They fight, they fly, they swoop into the water, they land in the trees above you. The photographic opportunities are second to none. But this adventure is not for the saturday afternoon photographer. Alaska, in the winter, is a rough place. You can die there... quickly. And it's not the easiest place to get to. First, you have to get to probably Seattle. From there you catch another flight into Juneau. From Juneau you can possibly fly into Haines but that is risky. Mainly because of the Alaskan winter. Air travel in Alaska is not like catching a flight to Atlanta. The weather can ground planes for days. It's happened to me before. So the reliable thing is to take the ferry out of Juneau into Haines. The ferry is pretty reliable. In the last several years it has only "not" made it once.... when the waves were 14 feet high. But for the most part, it's the way to go. Plus, you can pick up a four wheel drive vehicle in Juneau and take it on the ferry with you. Haines is small. They have a few rental cars... but few four wheel drive vehicles. So get your car in Juneau. The ferry ride is about 4 hours from Juneau and if you get a nice day it is one of the most beautiful sections of the inside passage. We had a super clear day on the way up... but the waves were 7 feet high and the wind was gusting to 40 miles per hour. And it was 15 below zero... making the wind chill factor 43 below. Needless to say, it will wake you up. The decks were covered with ice making it look like something out of a movie about an antarctic expedition. But it was unique and super cool. Once you get to Haines you won't find much. About 2000 people live there but not all of them stay for the winter. When we got there it was 14 below in Haines. There are a few hotels in town but there's a catch with that. Haines is coastal, so they don't get much snow. Chilkat is 24 miles inland... and they do. There is a lot of precipitation there in the winter. So its not unusual that you could leave Haines in the rain and end up in the snow within 30 minutes. And between here and there.... is ice. You do not want to drive off the road in this part of the world. They'll tell you to keep a candle in your car so you can stay alive all night by burning it on the dashboard if you get stranded. How many of you have a candle in your glovebox? Me neither. Here's the other catch. Alaska is a super cool place to visit in the summer. The sun comes up at 4 am and goes down at midnight. They shoot off the 4th of July fireworks in Anchorage at 1am. But in the winter, it's the exact opposite. It's not light enough, even on a clear day, to shoot pictures before 10am. And by 3:30, it's dark. 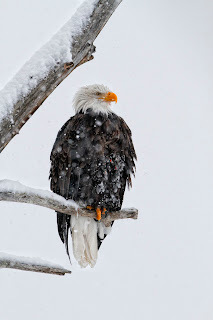 So I'd recommend staying out near the eagles. Figure Haines is mile zero. The eagles are good at mile 24. And the Canadian Yukon starts at mile 40. At mile 33 there is a place called 33mile (go figure). They have two cabins and a restaurant log cabin which is the only place to get food between Haines and Canada. More importantly, they are open all year, at least until 6. It's classic Alaska. Stuffed wildlife on the walls of of log cabin/diner where they serve food on plates the size of your steering wheel. But trust me, this is no time to watch your figure. The human body gobbles calories trying to stay warm... and believe me, you will be trying to stay warm. 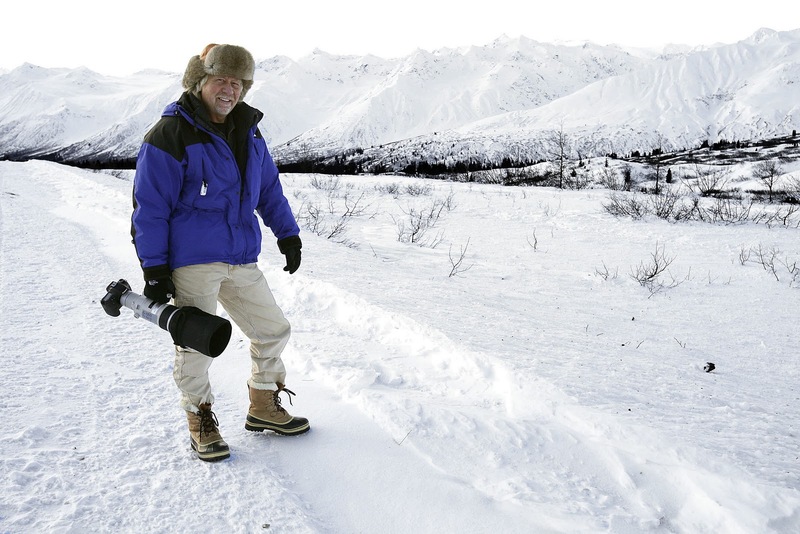 Fashion goes right out the window when you are in Alaska. It's all about staying warm. While I was there the temperature never got above zero.... and it was usually south of 10 below. 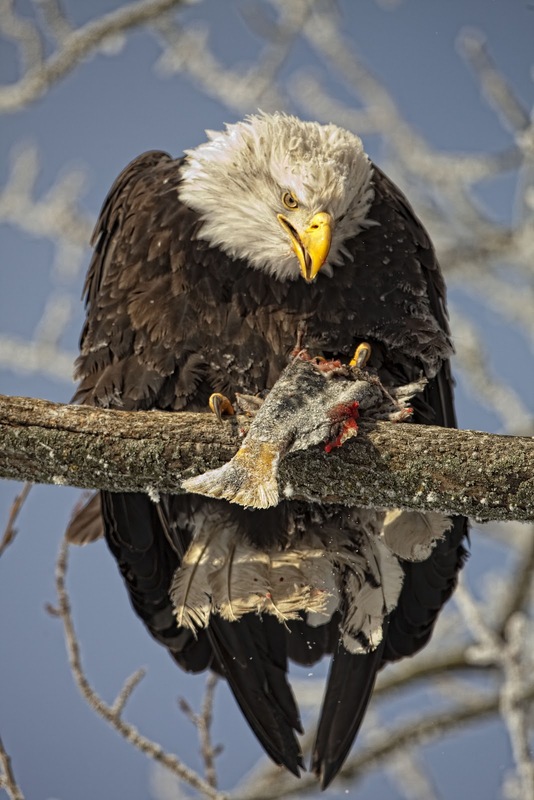 An eagle will pull a salmon out of the river and it will be frozen solid by the time he gets it to a tree. No lie. Moose are everywhere. Usually you will see more moose than people. And you will see bear tracks in the snow. Yes, bears hibernate. But because of the late salmon run and the plentiful fish... the bears stick around longer than they should. So you have to be careful. 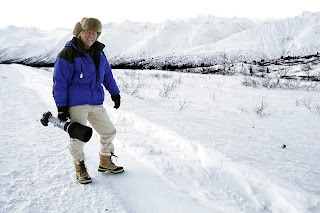 Out running a grizzly bear is a difficult task in the best of conditions. Doing it in 3 feet of snow is impossible. Maybe all of this is why the bald eagle still fascinates us. You don't see many of them and the ones you do see are hard to get to. But they are awesome and they will captivate you. The people in Alaska think of them as scavengers... much the same way we do seagulls. But I loved them. So enough said... here's a little "eye candy" from the trip. More pictures can be found on my still photography web page at oasisphotography.com. 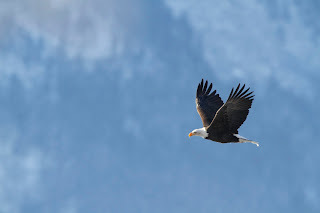 If you want more information about heading to Haines... or alaska in general, drop me a line. I'll share what I know. I've done my share of walking around up there. Not long ago our friends at Ames Scullin Ohare asked us to shoot a television commercial for Food Lion, one of their supermarket clients. At first glance the concept appeared to be pretty simple.... a series of actors celebrating the money they saved at Food Lion by doing an "end zone" dance in the Food Lion parking lot. We did our first bid in 35mm but with the slow motion the budget couldn't handle the massive amount of film we were going to run through the camera. So we offered up the RED camera in High Definition. It has the ability to shoot at 120 frames per second and there would be no worrying about film. But 120 frames per second was not "slow motion" enough. Wait a minute... not slow enough? Now this is getting interesting. One hundred and twenty frames a second is five times slower than real life. But apparently the Agency had been seeing some scenes on You Tube at 500 frames a second... and loved it. I had never shot with the Phantom, or seen one. We flew it in from New York along with a Digital Imaging Tech. These days you need a computer guru on every job it seems. Basically, the camera looked like a box with a lens on it. There was a viewfinder for me to look through but no button to turn it on or off. All of that was done from inside "the tent". It didn't even make any noise. I have to admit. I was impressed. I mean, we've all seen slow motion. If you are into sports of any kind it's really nothing special. But at 500 frames a second.... it is special and everyone who walked by the monitor during playback thought so. There's just something cool about life at 500 frames per second. Expressions last longer, clothes flow better... life seems "smoother" and more refined. The whole time we were shooting I remember thinking...."this is very cool, I need to shoot something else with this". It's not often that a technical effect can actually become "creative". But in this case, the technique is cool enough to develop creative concepts around. it would make for a great fashion spot for example. We ran some tests and I wish I had it to share. Basically we shot one of our studio guys shaking his arms and legs as fast as he possibly could. In real time, it looked like he was having a seizure. But when we played it back.... it looked like a dance. So here's the next best thing.... the clip below shows the same scene twice. Once at real speed... and then at 500 frames per second. It's about 5 minutes long because every one second is about 15 seconds of slow motion... but I think you'll enjoy it. The actress sprained her ankle badly in the first 5 seconds of this clip... you can actually see it happen if you look close... but she was a trooper and muscled through the rest of the take... but she was done after that. Pretty cool huh. Now here's a director's cut of the spot. Yep.... there's something about slow motion. Earlier this year we got a call from a producer friend of ours with JWT, the agency of record for Ford Motor Company, asking us if we'd like to bid on an upcoming Ford truck commercial to be filmed out West. We've done a lot of Ford work over the years and frankly were just happy to see them stepping back into the advertising game after a rough year for automobiles. Of course, we jumped at the opportunity. It was to be a series of spots called "Stampede" where about a thousand Ford trucks race out of the countryside, through a series of landscapes and towns towards a city near you. It was ambitious. I had done a Stampede job about six or seven years ago in Texas and this was a chance to work with some old friends. It was a challenge back then. We had 10 trucks and 10 stunt drivers (Chuck Norris' son being one of them). We locked the camera down in various locations and ran the trucks through different parts of the frame on a series of takes. Then the special effects guys (and gals) would composite them together and make it look like a stampede. It worked pretty well, although after piling five or six passes on top of one another the scene admittedly started to look a little muddy. It was still cool and I expected this job to be about the same. For starters, we were told we wouldn't be shooting any trucks. None. Nada. Zip. They had all been 360 degree modeled in a computer and the effects people could color them any color they wanted, spin the tires, bounce the suspension and move them in any direction they chose... and oh yea, don't worry about the dust... they'll create that too... right down to the reflections in the sheet metal. I started to feel small. During the first phone call we got a look at what they had in mind through a rough set of wireframes Green Grass Visual Effects had done. It was impressive. Apparently, we were to shoot dramatically moving backgrounds and reflection passes... sweeping moves up over and around invisible vehicles through farms, ranches, towns and cities. It was a tall order. For starters, it's always hard keeping bogie vehicles out of the shots for a car commercial. 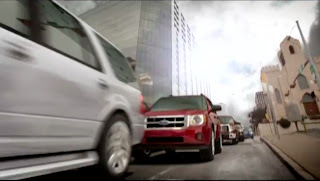 Ford does not take kindly to a Dodge or a Chevy in their shots. And this one required sweeping clean the downtown streets of Dallas and Austin, a small town nearby and anywhere else the stampede would have to run through. Plus, the camera basically needed to "fly" through those locations uninhibited. We had some money... but not anything on an Oliver Stone level. We decided to incorporate friends of ours into the job whom we had worked with in San Diego. Pursuit Camera Systems. I could go on and on about it here in print, but watch the video and you'll get the idea. They're "the deal" when it comes to shooting moving vehicles and after working with them in California I vowed to never do another running footage commercial without a camera vehicle like theirs. So we got them on board. Now I'd love to say I could operate the Pursuit Camera Vehicle... but it's not something you just jump on and do. In fact, it may be easier flying the space shuttle. So we brought in Brooks Guyer, a DP who can run the camera gyros like nobody's business. We used Brooks in California a couple of years ago and got some great looking footage. Fortunately, he was just coming off a movie in Pennsylvania and was available. Long story short. We got the bid and I headed to Texas, where the job was to be shot, to scout locations. It was going to be a multiple joint effort. We would be the production company, 3008 in Dallas would be the edit/ composite house and Green Grass EFX would be working on the vehicles. For a while, my part of it seemed pretty easy.... just drive down deserted streets and sweep the camera around. To get those streets swept clean, I brought in my friend and trusted AD, Garrett Freeberg, from San Francisco. If anyone could lock up the city of Dallas... it was him and a handful of Dallas' finest. It was on the location scout that things began to change. For one, I got a call from Green Grass saying that the deadline on the spots was carved in stone and not all that far away. As much as they loved the Pursuit shooting dramatic sweeping shots of Texas, they were concerned about having the time to track our moving shots. So as delicately as they could... they told us what they really wanted were locked down shots. I swallowed hard. we had just sold the agency on this fancy camera car system. Well, if we were going that direction... we certainly didn't need hot shots like the Pursuit team on this any longer. So the decision was made to drop them. Which I hated. Then, if we were going to be shooting locked downs... and these guys really wanted sharp crisp images to work with.... why were we shooting film? So I suggested HD, maybe something like the RED... or better yet, let's shoot it with one of the new Canon DSLR cameras that everyone is raving about. We owned several. It was a sell that needed some explanation. One minute we were showing up with the fanciest camera car on the planet with a big 35mm motion picture camera on it... and the next.... we're standing there with what looked like a 35mm still camera in our hands. But it didn't end there. As I looked at these locations, nothing moved in them. There were no blowing trees, no people, no birds, no flags, no movement. Why were we even shooting motion? So in went another call to the agency. 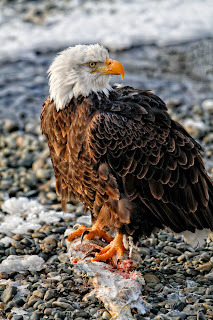 Those of you who know me, know that I am also a still photographer and have a gallery here on the east coast. The marriage of high definition video to the new era of still cameras really excites me and is right down my alley. In retrospect, my background came in really handy because by the end of the day it was decided that we'll just use stills for the background plates. If I was not also a still shooter I would have had to brought someone else in... or maybe the agency would have. We decided to shoot with the Canon 5d MK II so if the need to shoot motion arose (and it did) we could handle it with the same camera. 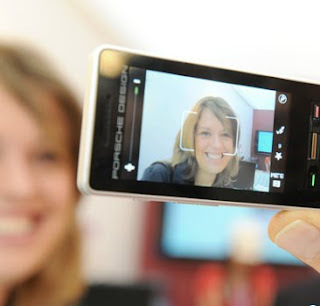 The resolution would be 5 times greater than High Definition video and give the animators plenty of room to work with. It also gave us another opportunity... HDR. High Dynamic Range photography is somewhat new. Basically you put the camera on a tripod and take a series of photographs at different exposures. Then you feed those shots into a computer and magically it takes the best parts of each shot and blends them together into one very cool image. It was a perfect way to deal with the bright skies and dark "canyon's" a city can create. And since we would now be working with one still image... 3008 could build the perfect background plates for the vehicles to drive through... and even erase any stray vehicles that we may not be able to get off the street legally on the shoot day. Plus, if we shot them some blowing flags and flying birds... hell... they'll stick some of that in there as well. Things were coming together nicely. I still had a hard time getting my head around how they were going to take my 2 dimensional still shots and wrap them around a 3 dimensional environment but let's just say that the guys at Green Grass are magic. Or at least that's what I want to believe. Sometimes you just have to have a little faith... which is what I resigned myself to. Now that we were shooting stills... and on some occasions high definition video with the Canon, it opened up other possibilities as well. For starters, I had just returned from shooting beautiful landscapes in the Palouse region of Washington State... America's breadbasket, the summer before. We went through some of those pictures and pulled together enough elements to bring some real life to the farms and ranches that otherwise were going to have to be made entirely in a computer... something the agency was a little concerned about. We kept hearing the phrase... "photo realistic". So that really helped put their mind at ease. The shoot was scheduled for Texas... but before we left for the Lone Star state we mounted a little shoot of our own in downtown Charlotte and Atlanta. We figured if we were going to just shoot background still plates... let's throw a few more cities into the mix. We kept the crew small and wandered around those cities on early Sunday mornings before there was any traffic. Now we were really building a backgrounds library to work with. Then the FBI showed up. OK... back up....a little explanation. We were downtown in Charlotte photographing the street in detail. Shooting a shot... moving 20 feet and shooting another and so one. We were building detailed panoramas that the computer generated vehicles would eventually drive through. It didn't occur to me that we looked like we were on a recon mission. About half way into it I heard someone walk up behind me and say... "can I ask what you are doing?" I told him. He looked like a normal guy, nice guy. He asked me if I had a business card. I did, but it was 9 blocks away in my car. Then he asked me if I had any ID. I did, but again... in my car. That's when he pulled his ID. FBI. He suggested we take a little ride down to my car. Who was I to argue. When we got there we were met by a police officer with a computer in his car. He ran a background check on me. I guess it turned out OK because no guns were drawn. Apparently, I was taking too many pictures around the Bank of America and Wells Fargo HQ buildings. I didn't think I looked like a terrorist, but apparently I did. They took my camera... and eventually the shots I took of the banks. I didn't argue and consequently I didn't end up in jail... but I was strongly encouraged to stay away from the banks. It's always something. Anyway... long story short... the spots are now finished. One of them is going to play on the new jumbotron in the American Airlines Arena and others are coming to your TV all over the country. You can check this Texas version out (below). If you look closely you will see the vehicles drive through Dallas, turn a corner into Charlotte, pass through a small town Bonnie and Clyde once drove through, race into Atlanta and bounce around Austin. Along the way they'll hit Washington State and the Idaho panhandle. And if you take into account the sky replacements... the palette wides still further. So this is what it has come to. It makes me wonder how long it will be until we no longer shoot talent... or anything real for that matter. I mean, the players in the 2010 Madden Football video game look pretty good to me. How long will it be until that game looks like a clip from SportsCenter. And a friend of mine told me the other day that there are audio guys working on technology that can turn anyone's voice into whatever they want it to sound like. I'm glad I was alive during the time that we actually staged things and photographed them. It was fun. Because pretty soon, those nerdy kids that you and I made fun of in high school computer class ... they are going to be doing all of the cool stuff, making all of the money and monopolizing all of the cute chicks. Not long ago, while on location out West I got an email from a location scout friend of mine back in Charlotte. He had been contacted by a large and pretty well known production company (who will remain nameless) to find locations for a Jimmy Johnson NASCAR commercial. The script called for three locations. One was the Service Department of a car dealership, another was a kitchen and finally they needed a studio. Finding an abandoned car dealership (unfortunately) proved to be easy. He found one not far from the Oasis Studios. Knowing we have a permanent kitchen set in our studio it was not surprising that he called us to see if we might be interested in renting out our space for the commercial. Naturally I had some questions... like power requirements, lights, number of cast and crew members, etc. to see what kind of impact it would have on what we already had going on at the studio. Here's part of his response. "... they're looking for a modern kitchen set and a white cyclorama. There are about 30 cast and crew and they are thinking about using available (natural) light..."
I told him that I understood but that since the kitchen is in our studio... there is no natural light. After some explanation here is part of his follow up email. ".... as far as lights go, I don't think they'll need much. They are shooting the commercial with a camera phone"
Yes, apparently it has come to this. Go Jimmy. "Ah... so you're the one"
The other day someone said to me "hey, I read your blog!" 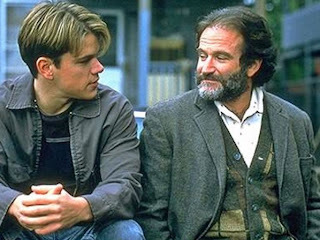 I couldn't help from borrowing a line from Robin Williams in Good Will hunting and replied "Ah, so you're the one"
Then it occurred to me that if people are actually going to read this from time to time... I probably should write some relevant stuff in here. So today it begins. Read on and I'll start passing my dime store wealth of knowledge onto anyone who will tolerate it. I never really thought we'd have something as geeky as a "blog". But our web guru people tell us that we need one to help keep Oasis Films at the top of the web search lists when people look for Commercial Production Companies. The want us to put all kinds of catch words and phrases in here like "great commercials, beautiful cinematography, wonderful director, comedy, lifestyle, film production, high definition, wildly creative editing, innovative, award winning television commercials, fun to work with, North Carolina, Southeast, super duper creative team, blah blah blah... you get the idea. So who are we to argue? We try to do whatever it takes to keep the doors open, the heat on and some morsels of food on the table. I suspect over time you'll read some interesting stuff here, some funny stuff ... and some stupid stuff. Overall, it will be fun... and that's what we try to be all about. 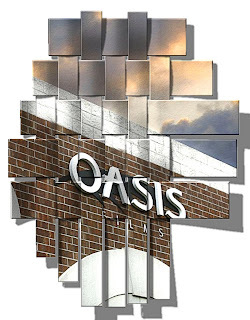 Oasis Films is a full service 35mm film / high definition production company. we specialize in commercials, music videos, corporate and web presentations as well as documentaries. we represent one director / cinematographer, Jeff Smith. Jeff specializes in dialog, lifestyle, food and automobiles. So stop in from time to time, catch up and enjoy! ...and oh yea... if you want to go to the webpage, just click on the green Oasis Films logo above. You'll find our sample spots there.